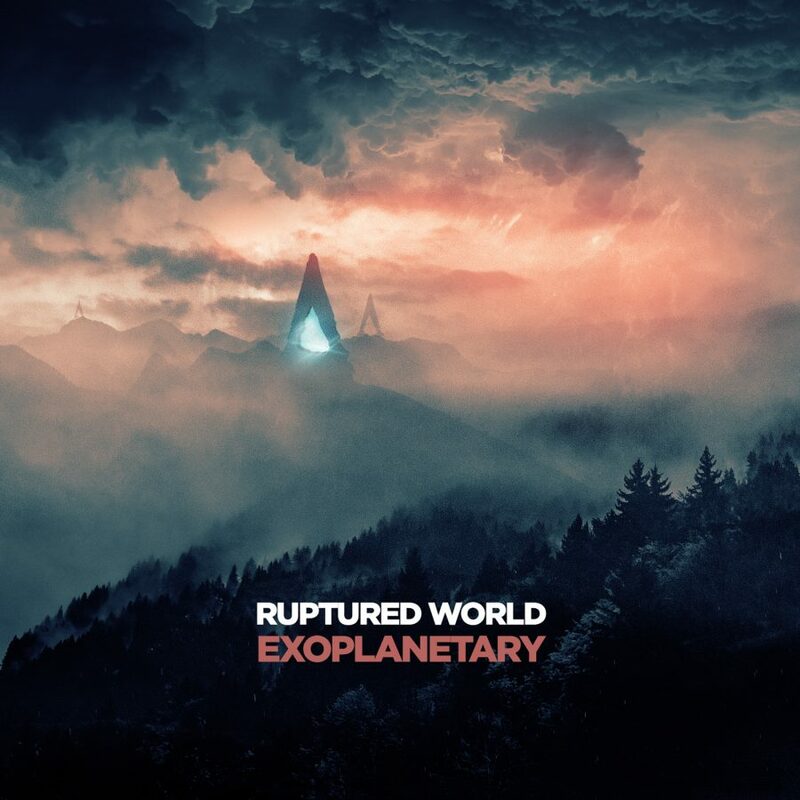 Exoplanetary follows the story of a scientifically based exploration of the planet Proxima Centauri B. Ruptured World is a sci-fi cinematic dark ambient release created by weird fantasy and horror fiction author Alistair Rennie. Exoplanetary takes Rennie’s knack for writing fiction into new territory, giving us something that feels familiar, and yet new. Most tracks feature spoken-word, which is all performed by Rennie himself. Along with the booklet, this gives the album a lot of material for listeners to absorb, making multiple listens a must. Thankfully those multiple listens have been equally as enjoyable as the first. The mission plan refers to “select members of the human species”, leading me to wonder about the class warfare that must be happening simultaneously (though this theme is not explored on Exoplanetary). As the 99.9% realize that they are going no where, and Earth will soon double as their grave marker, drifting through infinite space. On “The Sunken Valleys”, Rennie speaks in his sort of 50s sci-fi movie style voice, explaining the characteristics of the landscape. But, there is even further detail committed to this topic in the 16 page “Executive Mission Summary” booklet, which accompanies both the digital and physical versions of Exoplanetary. “The Twilight Hours” begins by explaining a bit about the Krivren species, which appears to be a deadly, intelligent race of creatures that populate Proxima Centauri B. Again, here, the booklet goes into even greater detail about this alien race, giving us enough information to start forming images of these creatures in our minds, as well as hearing their communications throughout the track. “A Time Without Saviours” picks back up on this dialogue, this time going into more detail about the routines and actions of this race, and their possible understanding of humanity’s arrival. “A Time Without Saviours” is likely my favorite track on the album. It slowly builds until we hear some dialogue I mentioned above, then the track turns musical, allowing a slow almost glitchy melody to become the new focus for the remainder of the track. This section is highly evocative of some of my favorite Sabled Sun melodic sections. In fact, probably my favorite thing about this album, as a whole, is its similarities to the Sabled Sun 21XX series. But, here we are more focused on conveying the story through actual dialogue and through the accompanying booklet. Whereas with Sabled Sun there is much more left to the imagination, in terms of specific greater plot details, and the focus is instead on real-time soundscape cinematics (i.e. electronics bleeping, footsteps, doors opening). I wouldn’t commit to liking one or the other style better. I think it’s great to see these themes covered from varied angles. “The Voyage of Tarknassus” brings together all the elements of Exoplanetary in a concise fashion. We hear a radio tuning into a station, finding a beautiful piano arrangement. This soon shifts to a transmission of the voice of Dr. Hector Macrae, which eventually trails off into a slow droning section. This seems to give listeners time to contemplate the words we’ve just heard and the greater plot of the album, going on for eleven minutes as the longest track. Exoplanetary ends on peaceful note, being another of the more musical tracks. A number of different elements come together here, built upon a peaceful drone and a prominent bass line. Cryo Chamber continues making their bold moves into varying fringes of the dark ambient genre. Yet again, it seems they’ve made a successful gamble, bringing an artist into the fray with some highly detailed visions for his work. Alongside Simon Heath, this is likely to be a highly fruitful endeavor in the future, just as we’ve already seen here on Exoplanetary, as well as in similar circumstances with God Body Disconnect. 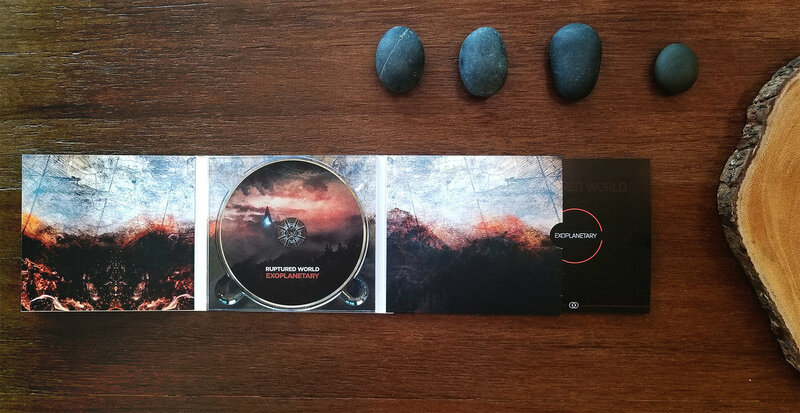 Ruptured World must be the best project I could recommend for lovers of Sabled Sun and other cinematic sci-fi ambient releases. There is a little here of everything that makes that sub-genre so compelling. 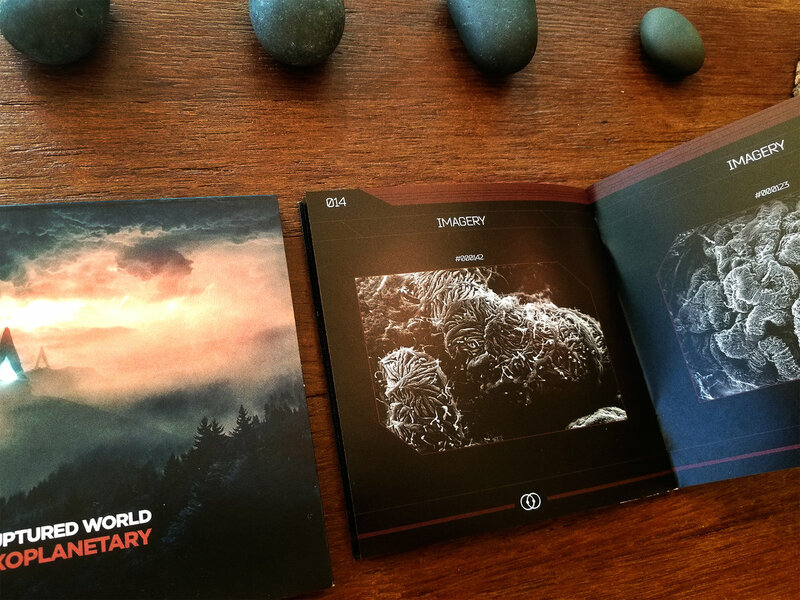 The beautiful cover-art, booklet and layout of Exoplanetary make it all the more attractive. I wouldn’t recommend this as background music, there are plenty of dark ambient albums out there that will blend nicely into your evening. Ruptured World asks more of their listeners, but the reward is worth the effort. Highly Recommended!